When you’re towing a heavy trailer, you depend on your truck to be able to handle the added weight and strain with ease. Built with a variety of configurations available, the Ram 3500 can be the solution you need for the job. 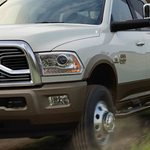 But what makes the Ram 3500 such a popular heavy-duty pickup truck? Take the available Max Tow Package, for example. It features a 30,000 pound rated fifth wheel hitch capable of handling a wide range of weight. At a touch of a button you can select from two different ride heights with the rear auto level air suspension system. This allows you to stay level with your trailer through automatic adjustments while on the road. Come to our Ram sales center at Porterville Chrysler Jeep Dodge so that we can show you what other features are available on the 2018 Ram 3500 and set you up with a test drive today.